Nothing says the Fourth of July like the smell of fresh cut grass, clear blue skies, the sound of crackling fireworks, and of course Red, White, and Blue. 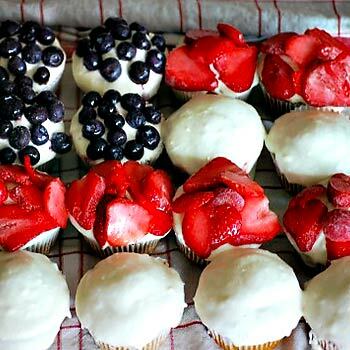 Today we’re sharing our favorite berry patriotic treats, all featuring bursts of red, white, and blue flavor! Most of these dishes are simple and fast, so they can be put together in advance or quickly so you can go back to enjoying your day! 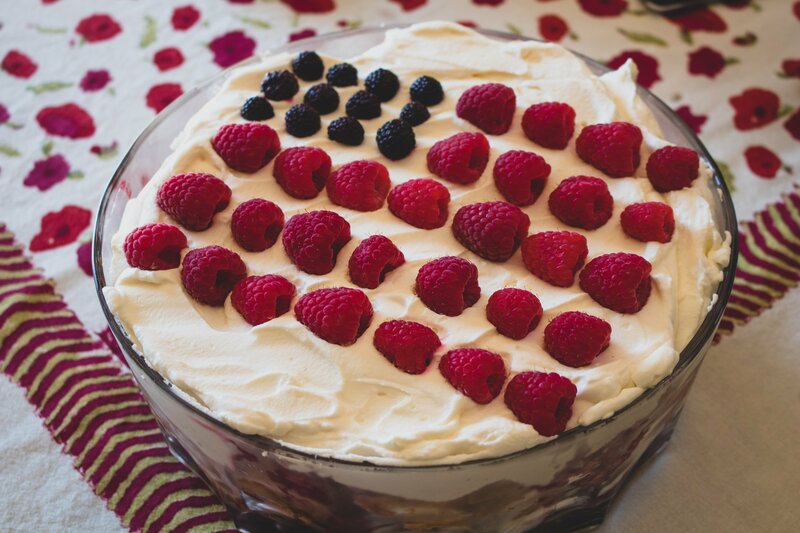 Layer a large bowl or deep dish with angel food cake, berries, cream until you reach the top of the dish. Finish off the top layer with an arrangement of berries. Serve immediately and enjoy! 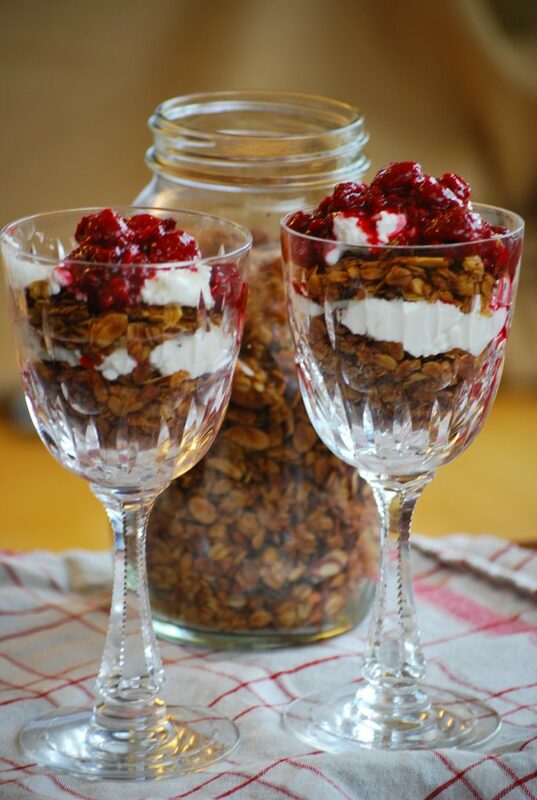 Layer parfaits with granola at the bottom, topped with berries, yogurt, another layer of berries, and top with a dollop of yogurt. Drizzle with honey and sprinkle with nuts. Stahlbush Island Farms frozen blueberries or black raspberries and red raspberries or strawberries for garnish. Combine the sugar cookie mix, egg, and butter until smooth and dough forms. Turn out the dough onto a well floured surface. Roll out dough into a rectangle shape. Cut the edges to make a clean rectangle. Place on an ungreased cookie sheet and bake for 7-9 minutes, or until golden brown. Let cool completely. Meanwhile, using a hand-mixer, combine the cream cheese, sugar, powdered sugar, and lemon juice until smooth. 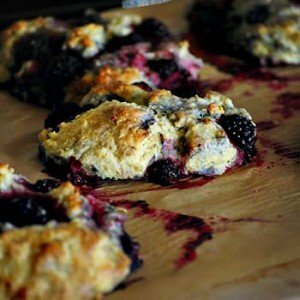 Spread frosting evenly across cool cookie, and top with berries. Serve immediately. Line muffin baking tin with paper muffin cups, set aside. In a medium bowl, stir together flour, baking powder, cinnamon, baking soda, and salt. Add sweet potato puree, applesauce, and almond extract. Stir until combined. Add flour mixture, and stir until combined (batter will be thick). Bake about 20 minutes, or until a toothpick comes out clean. Cool in pan on wire rack for 1 minute. Add bourbon or milk and beat until combined. Beat in powdered sugar, about ½ cup at a time, until smooth. Top cupcakes with blueberries and sliced strawberries. Serve immediately. Mix in the chocolate chips and berries. In a separate bowl, combine the eggs, milk, and vanilla. Turn the dough out onto a lightly floured surface and gently form it into a bowl. Make the blue ice pops! Combine blueberries and 1/4 cup sugar in a saucepan with 1/4 cup water. Simmer for about 7-10 minutes or until the strawberries are nice and soft. Transfer the mixture to a blender and add the lemon juice. Blend until smooth. 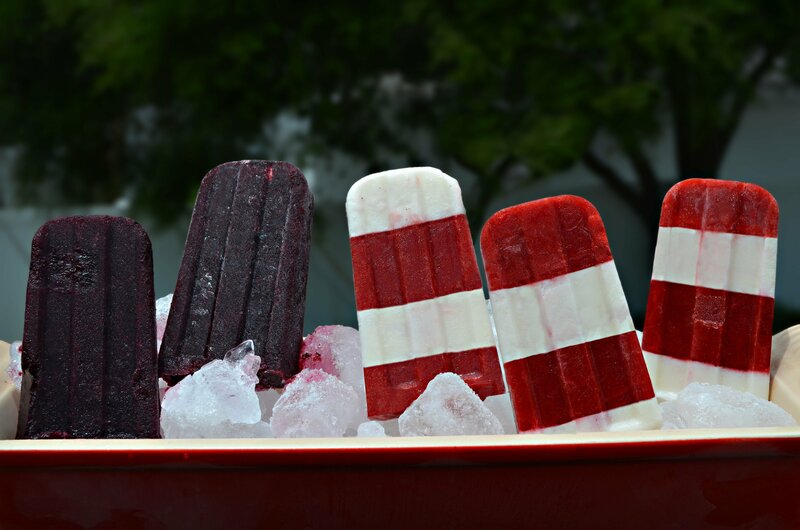 While the mixture cools, make the red and white pops. Place the frozen strawberries in a bowl with 2 Tbsp. powdered sugar. Make a simple syrup by combining 1/4 cup sugar and 1/4 cup water in a saucepan. Stir until the mixture comes to a boil and the sugar is dissolved. Let chill. Combine the honey, yogurt and simple syrup into a blender and blend until smooth. Pour all of the blueberry mixture into half of the molds, leaving 1/4 inch space. Pour a little of the yogurt mixture into the molds, enough to just cover the bottom of the remaining molds. Set aside the remaining mixture. Freeze for about 40 minutes. Meanwhile puree the strawberries and powdered sugar in a blender. Bring the molds out of the freezer and pour the strawberry mixture over the yogurt mixture until about half full. Freeze for another 40 minutes. Take them out and repeat the white layer using remaining yogurt mixture. At this point, place the sticks in the center of the blueberry pops. Freeze for another 40 minutes. Take them out and top with the remaining strawberry mixture. Add sticks in the center of each remaining mold. Freeze untouched for another 5 hours or until solid. 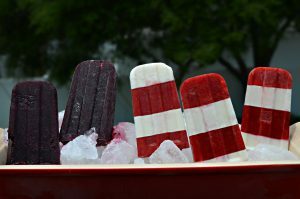 If you don’t want to take the time to create the layers, you can create a marble pattern by pouring all of the white mixture into the molds, topping it with the red mixture and swirling them together with a wooden stick before popping them in the freezer. After about 1 hour, don’t forget to take them out to insert the wooden sticks into the centers.